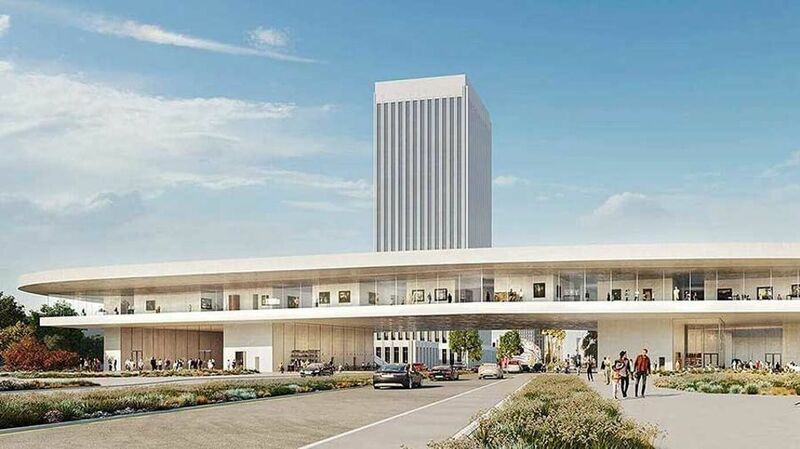 Today the five members of the Los Angeles County Board of Supervisors unanimously voted to approve a $650m extension of the Los Angeles County Museum of Art (Lacma) designed by the Swiss architect Peter Zumthor. This vote of approval also allocates $117.5m in funding, the remaining balance for the county's $125m contribution, and an associated $300m bond to the project. Around $560m total funding has been raised to date. This design was a significant rejigging of Zumthor’s previous concept for the project, an organic “black flower” form building inspired by the work of the artist Jean Arp. The 368,000 sq. ft glass-enclosed, sand-coloured concrete building spans Wilshire Boulevard and replaces existing gallery buildings on Lacma’s East Campus that date to the 1960s and 1980s. “We were aware that this building project would be not as big as the current space it was replacing because that was a jumbled mess of galleries,” Govan told the Los Angeles Times last week. In addition to art world members like the artist Diana Thater, celebrities like the actors Brad Pitt and Diane Keaton spoke at the meeting in support of the project. Meanwhile, the building design has been panned by critics including Giovannini and the Los Angeles Times art critic Christopher Knight. In a statement following the vote, Govan thanked community members for their “thoughtful comments” which he says have helped make the building's design “simpler, more beautiful, more transparent, with enhanced access to the park”. Lacma plans to begin construction on the project in early 2020 for a 2023 opening date.